What is an integrated supply chain? Explain how two selected businesses have been able to integrate their supply chains. What is an 'integrated supply chain'? 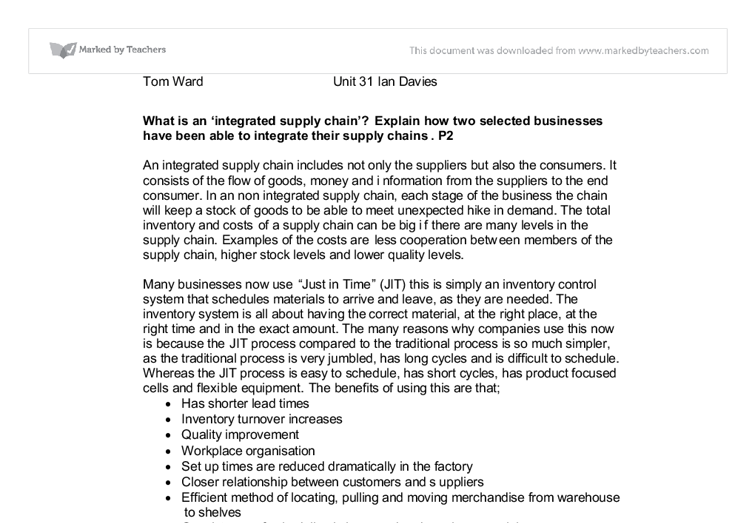 Explain how two selected businesses have been able to integrate their supply chains. P2 An integrated supply chain includes not only the suppliers but also the consumers. It consists of the flow of goods, money and information from the suppliers to the end consumer. In an non integrated supply chain, each stage of the business the chain will keep a stock of goods to be able to meet unexpected hike in demand. The total inventory and costs of a supply chain can be big if there are many levels in the supply chain. Examples of the costs are less cooperation between members of the supply chain, higher stock levels and lower quality levels. 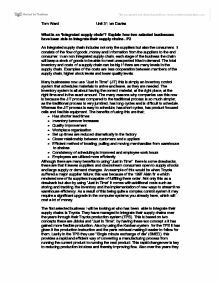 Many businesses now use "Just in Time" (JIT) this is simply an inventory control system that schedules materials to arrive and leave, as they are needed. The inventory system is all about having the correct material, at the right place, at the right time and in the exact amount. ...read more. This is based on two concepts these are Jidoka and "Just in Time", by having these two concepts it has gained more flexible production. Also by using the Kanban system for the TPS it has given it the production instruction and the parts retrieval making it easier to follow for them. Lastly in the TPS they use "Single minute exchange of die" (SMED) this provides a rapid and efficient way of converting a manufacturing process from running the current product to running the next product. This rapid changeover is key to reducing production lot sizes and thereby improving flow. Also over the years they have managed to integrate the supply chain by cutting down on their warehouse space. This is done by them as they only make what is needed, when it is needed and in the amount they need. They do this by when a vehicle order is received; a production instruction is issued to the beginning of the vehicle production line as soon as possible. ...read more. The less obvious benefit is the higher quality customer service that arises from the JIT burger assembly. When McDonald's waits for you to order the burger, they do a few things to improve customer service. When you place a special order, it doesn't send McDonald's into a panic that causes huge delays. Now that McDonald's is in the practice of waiting until you order a burger until they make it, they don't freak out when they have to make a special order fresh just for you. This higher quality customer service is subject to McDonald's ability to actually produce faster. Without this ability, McDonald's ordering costs would be sky-high because the costs associated with ordering would be the loss of customers tired of ordering fast food that really isn't fast. "Just in Time" allows McDonald's to adapt to demand a little bit better. Seemingly, lower inventory levels would cause McDonald's bigger problems in a higher demand because they wouldn't have their safety stock. However, because they can produce burgers in a record time, they don't have to worry about their pre-made burger inventories running out. ?? ?? ?? ?? Tom Ward Unit 31 Ian Davies ...read more. They opened their first store in the UK in 1929 in Burnt Oak which is located in Edgware in North London. They then became a private limited company in 1932. Tesco kept growing into new markets and countries. Tesco launched their new clothing range in 2001 - Florence and Fred. The Carphone Warehouse do not want too many 'Stars' because they require cash injection. A 'Star' of The Carphone Warehouse would be TalkTalk which has a large share of the market but involves high cash injection. Stars have the potential to turn into Cash cows. I will also put up posters locally, the cost of these promotion strategy will be very cost effective and I will be able to measure the difference of customers I will therefore gain after the 2 months of new advertisements. These are: "Our Value range offers you our lowest price on the widest range of products, without ever compromising on quality. So you can feed your family within your budget and still trust that they're getting the good food they need." Inside the Disneyland park resort there are 5 different lands these include Fantasy land, discovery land, Adventure land ECT. There is an endless amount of rides and attractions for all ages, there are big thrills such as Big Thunder Mountain for adults. This can be done through here customer service. When a customer goes into any of these online supermarket websites they will always compare the prices of each product through different websites such as ?my supermarket?. So as a result of this ASDA provides better customers service than Tesco because ASDA always respond to the customers through social media and their website.